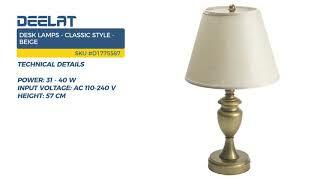 The desk lamp has a power rating of 31W - 40 W. The input is 100-240V AC and the color is beige. The desk lamp serves to illuminate an area and has a switch button control. The unit has a beige linen shade with a bronze/copper stand, utilizing E14 screw-in LED and incandescent light bulbs. The desk lamp is ideal for home offices, bedrooms, and other interior spaces that have lighting needs.